10/05/2012 – The Netherland knows their IT well and nobody is better placed than Computer! Totaal to give a good review and honest opinion about the technology out there. 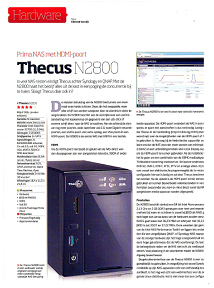 For their October 2012 issue, the Dutch print magazine took the smallest of the Intel® Atom™ based NAS from Thecus® and tests it thoroughly. The outcome, the 2-bay N2800 performed well and received 4 stars! The N2800's hardware is well known by now. Intel® Atom™ processor, 2GB of DDR3 RAM, 2 storage bays compatible with 2.5” and 3.5” SATAII/III HDD (including the WD Red drives especially designed for NAS environment), and 2 LAN ports which support link aggregation. All combine inside a sturdy and stylish chassis and managed by the ThecusOS 5.0, the results can't fall short. Like mentioned by Computer! Totaal, “The performance is good”. Thecus® brought innovation to the NAS industry when they decided to equipped their new units with HDMI outputs and USB 3.0 ports. “With the USB 3.0 and the HDMI they have added new functions to a NAS product.” The USB 3.0 provides ten times faster transfer speed! This means backing up your data on external HDD or transferring information to your NAS in a flash. The HDMI output combine with the Local Display module unlocks the multimedia power of the Intel® Atom™ processor embedded in the N2800. It also eliminates the need to have a computer between your NAS and your TV screen to watch HD movies at home. “The HDMI adds a good functionality”. All controllable through mobile applications like HippoRemote for Apple products and Valence for Android devices, your NAS content which is directly displayed on your big flat screen can be managed by the tip of your fingers while comfortably seated in your living room. Overall, the complete connectivity, powerful hardware and the many applications offered by the N2800 make this NAS more than just a simple data storage device. 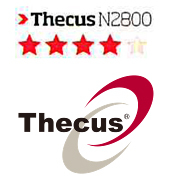 “With the N2800 Thecus does deliver a complete NAS for a very affordable price. The fast hardware makes it ideal for power users who need to use the NAS intensively.” With that said, it is no surprise that Computer! Totaal awarded 4 stars to this powerful multimedia data center. The N2800 is part of the Vision series which units of different bay size are all equipped with the powerful Intel® Atom™ processors. Offering similar performance and more storage space, you'll find the N4800 with 4 bays, the N5550 with 5 bays and the N7510 for 7 bays of up to 4TB compatible HDDs. While the later ones are tower format NAS, the N4510U is a 4-bay rackmount for SMB and enterprise. The complete review can be found in the October 2012 edition of the Computer! Totaal magazine.